Posted by Ali Kane on Tuesday, April 16th, 2019 at 2:23pm. 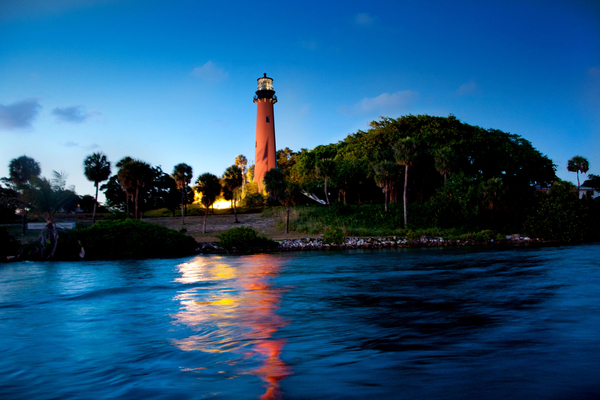 The Jupiter Inlet Lighthouse and Museum is hosting two Lighthouse tours this week. This Wednesday, April 17th, the lighthouse is hosting their reoccurring Lighthouse Sunset Tour and on Friday, April 19th the lighthouse is hosting their Lighthouse Moonrise Tour. Climb to the top of the lighthouse this Wednesday night and take in the spectacular view of Jupiter, the ocean and the incredible Florida sunset. You will event get a change to you’re the Lighthouse Watch room and watch the lighthouse turn on and illuminate the sky. The tours are weather permitting, and children must be 48 inches tall to climb the 105 steps to the top of the lighthouse. Tickets are $20 dollars per person and $15 dollars for Lighthouse Members. Children must be accompanied by an adult. Tours last approximately 75 minutes. The tour starts at 7 am this Wednesday. To purchase tickets, click here. This Friday, the Jupiter Inlet Lighthouse and Museum is hosting their monthly Lighthouse Moonrise Tour. Climb to the top of the lighthouse and get a spectacular view of the full moon over the water and Jupiter. The Moonrise Tours are weather permitting, and children must be accompanied by an adult and must be 48 inches tall to attend. Tickets are required and cost $25 dollars per person or $20 dollars for Lighthouse Members. The tours last 75 minutes and start at 7:15 pm this Friday. To purchase tickets, click here. The Jupiter Inlet Lighthouse and Museum is located at 500 Captain Armour’s Way in Jupiter.